Candy corn is already on the grocery store shelves and soon it will be time to head to the local farm to pick pumpkins. Carving pumpkins is just one fun way to get a little creative with a DIY decoration for Halloween. With a few craft supplies and your imagination, you can create beautiful, scary or breathtaking designs for your pumpkins. Here are some unique pumpkin decorating ideas for kids and adults to enjoy crafting together this fall. Set out your favorite paints and let your kids go wild! Painted pumpkins become beautiful works of art, no matter what your age. Kids can paint faces, animals and pretty scenes to their hearts’ content. For an elegant pumpkin, spray paint the entire thing with gold or silver paint. You can even add your house number with or without stencils using black paint and set the pumpkin out on your front step. For a fun twist, try painting the pumpkin with chalkboard paint and then have some fun decorating with sidewalk chalk leftover from the summer. With some straight pins and shiny sequins of your choice, you can create sparkly designs, swirls, and patterns on your pumpkin. Simply place the sequins as desired and push the pin straight into the pumpkin. You can also make designs on your pumpkin with string or yarn, using the straight pins to redirect the yarn’s path across the pumpkin. Place down a little newspaper to catch loose glitter. 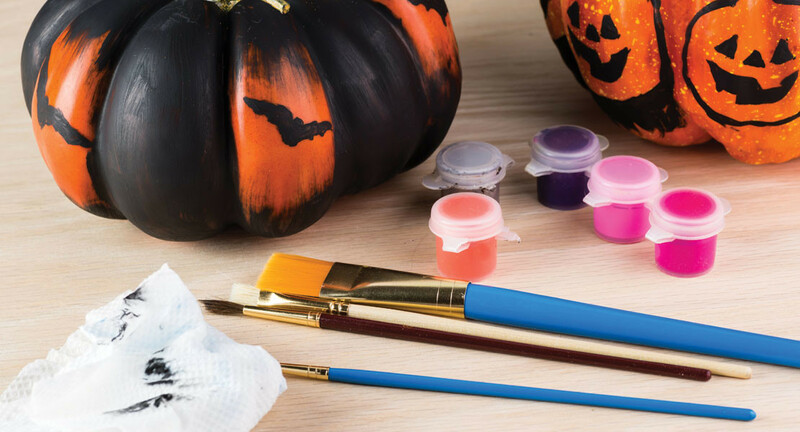 Next, use craft glue or school glue to create pretty patterns and designs on your pumpkin. Finally, sprinkle the glitter directly over the glue trails and ensure they are well-coated. Allow to dry thoroughly before attempting to touch or move the pumpkins. Glue some paper doilies onto your pumpkin for a delicate and graceful effect. You can apply plain white doilies or paint the doilies in a color of your choice. Before gluing, try overlapping the doilies in different arrangements to find the one that looks best. If you are extra crafty, you can also crochet a doily or several smaller ones to decorate the pumpkins with a fancy look. If you can’t find doilies, you can also create dainty pumpkin designs with different lengths and styles of craft lace. Kids will especially love the fun of making faces on their pumpkins. Gather fun craft supplies like feathers, foam sheets, wiggly eyes, markers, paints, glitter glue, stickers, and more. Give participants of all ages the complete creative freedom to make fun pumpkin faces of their own design. Some enjoyable designs to make may include animals, characters, Halloween ghouls, or an impersonation of one of their favorite family members. Keep those paints and markers handy! You can use craft stencils to create pretty patterns or spooky messages on your crafty Halloween pumpkins this year. Choose fall designs like leaves and Halloween scenes or go for something in a different theme like a tropical pumpkin, romantic pumpkin, or a neat design like Chevron, paisley or a floral pattern. Dress up your pretty pumpkin Minnie Mouse style with gorgeous ribbons and bows. Wind ribbons all the way around your pumpkin for a neat woven look or simply buy a few spools of Halloween ribbon and create cute vertical or horizontal stripes across your pumpkins, gluing each of the ribbon lengths in place. If desired, top your pumpkin with a pretty bow tied to the base of the stem. Similar to the pin idea, get a few boxes of silver or gold flat thumbtacks and go to work decorating the pumpkin with pushpins. The final result may take a little while to complete, but the look is sure to be a unique, metallic and dimensional rendition of a favorite fall fruit. Give your pumpkin a voice by painting or writing some words on it. You can use a paint pen, markers or paints of your choice to create a winning look. Try fun and creative handwriting styles or you can even consider more of a ransom note pumpkin, gluing on a fun Halloween message with letters cut out from magazines. Cover your pumpkin in a coating of patterned duct tape for a fun and mess-free way to decorate this year. You can find patterns of all kind—leopard print, tie-dye, metallic, plaid, polka-dot, paisley and more. You can also try a combination of patterns or colors to create a simple yet colorful pumpkin masterpiece. Keep it simple with stickers or decals to give your child or grandchild something to do this Halloween season. You can dress up the pumpkin with a special pattern or just let kids all the way down to little toddlers go nuts putting on as many stickers as they like. These may not be the most elegant pumpkin designs when complete, but they sure are easy to make and clean up. Look for fun pumpkin decorating kits to try this year. You can find pumpkin accessories like “push-ins,” which are basically facial features and other accents for your pumpkin. If you still have your Mr. Potatohead pieces lying around, better yet! Pick up some lovely rhinestones at the craft store and deck your pumpkin out in all that glitters. Use hot glue or tacky craft glue to affix the gems to all visible parts of the pumpkin. Combine with the spray paint idea above to create a pumpkin that really sparkles. Next time you pick up a pumpkin at the farm or pumpkin patch, try one of these innovative decorating techniques. It can be a fun treat for the whole family to try something new instead of carving yet another pumpkin come Halloween time.